Painting from life is better than photographing with a camera, in my opinion. As a plein air painter I get to manipulate the information I see before me. Mother Nature is wonderful but not perfect so a few changes to enhance the visual appeal of a location is fun and challenging. This is a painting from the Wekiva Paint Out last week. 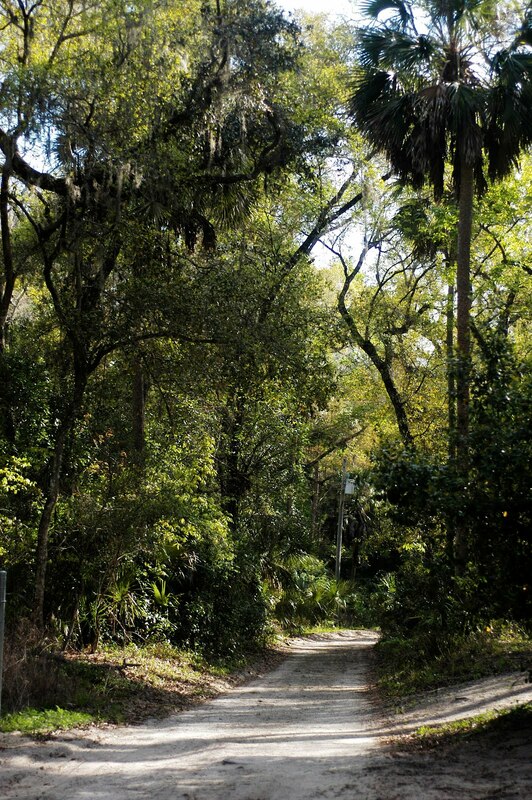 "Forest Path" is a little dirt road in the Wekiva Springs State Park. Each morning you can find the resident flock of wild turkeys ambling down the path, picking their way through the palmettos. My original intention was to include the turkeys in the painting. I had sketched my composition noting where the birds would be placed. As the painting progressed I decided turkeys would overload the painting and infringe on the feeling of tranquility I was aiming for so I left them out. The photo on the right shows the actual scene as it looked while I stood and painted. If you look closely you can see a few subtle changes from photo to painting. A couple of obvious changes were to give a greater bend to the path and a gentle leaning curve to the sabal palm on the front right. Mother Nature is the best teacher for a landscape painter. The majority of time I paint in my studio using photos (I will talk about pros and cons in a future post), color notes and small paintings done on site en plein air and memory. Plein Air Events give me to opportunity to get out in the field with other artists. Other times I just get myself out..yes, usually alone...to "recharge my battery" as Bean Backus used to say. Painting exclusively in the studio can cause my work to become stale. I am fortunate to have been invited to participate once again in the Wekiva Paint Out in Apopka, Fl. This was the 6th annual paint out. I have been in all 6 so I feel as though I am an authority and can testify that somehow they keep getting better each year. 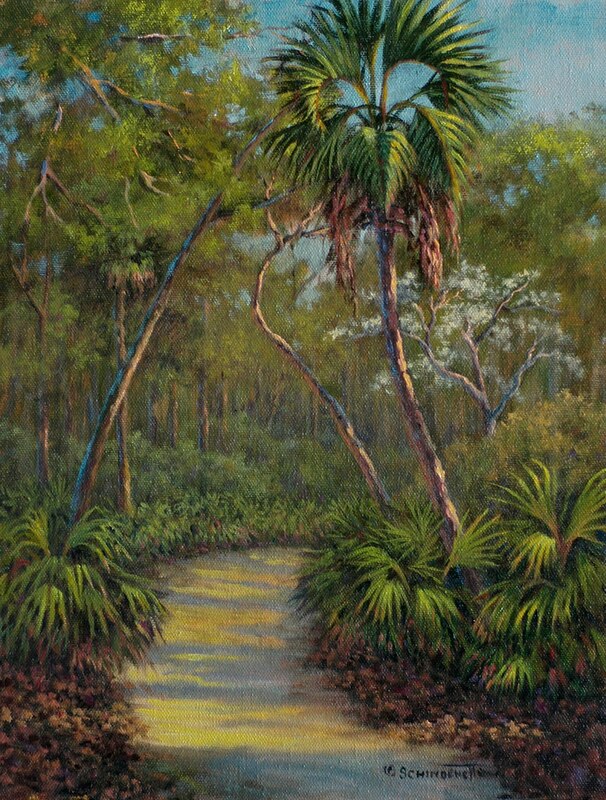 The Paint Out was hosted by the Wekiva Wilderness Trust and sponsored by Wekiva Island. Many thanks go to the Paint Out Team: Marce Wildman, Nina Chatham, Mary Sue Weinaug, Carrie Vanderhoef, Greg Whiteside, Reme Laman, Teri Siciliano, Erin Whiteside and Crystal Muntz. This team of remarkable people worked tirelessly before, during and after the event to make the paint out an unforgettable experience for the artists and public. 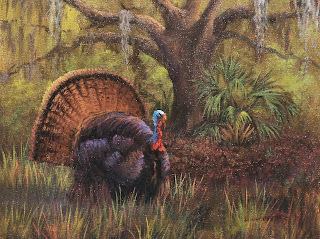 I painted "Tom Turkey" at Wekiva Springs where the flock strutted through the forest each morning. This guy seemed to beg to be painted. So how could I not? Check back here as I share with you what it is like to actually participate in this paint out...late night bonfires with smores, painting the moon at 2 am, swimming in the icy spring water, etc.